I marked the date by opening the first window on my Selfridges advent calendar. This was an early Xmas gift from my parents and I literally leapt out of bed early and prised open door number 1. Behind it was a mini Victor & Rolf Flowerbomb, a late friends very favourite perfume on me so it holds a special place in my heart and was a comforting start to the day. Dubai is currently experiencing its Winter. This means thunderstorms, torrential rain and grey gloom. You know you have lived here too long when this absolutely fills you with joy. I really went overboard with the wrapping up but I could not help myself. 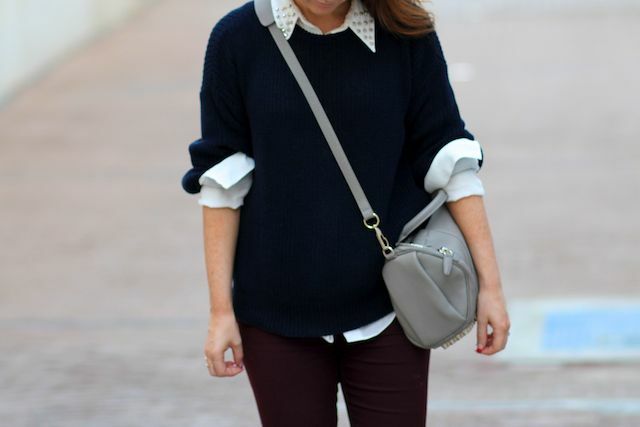 Plus I can never say no to a collared shirt/chunky knit combo. Sunglasses: House of Harlow Chelsea (LOVE these....I paid a fortune for my Celine cat eye shades but these babies are the ones I would recommend to friends, at under £90. They have an extreme curve but despite the drama they are still wearable) - Link! So cute!! I really like this outfit on you. :) haha neither can I! What a gorgeous bag! I also really like the little details on your top! I love this outfit!! Great bag, one of my favourites! I have these sunglasses and LOVE them, but I have them in black. I especially love the tortoise on you, gorgeous! What is the name/number of your Celine ones? Happy December Laura! i can already vision you with olivia palermo cut! would really suit your petite face! I just wanted to say I really love your style! I've lived in the Middle East for years and spent a lot of time in Dubai and so many people were badly/inappropriately dressed, so to see you dress so classy is really refreshing! Hope you enjoy National Day tomorrow! Love the look, if you google Amy Huberman, she had being sporting the EXACT look @ 6 months pregnant! wow you look really beautifil dear, i love your outfit :) and the location too!!!! I love that jumper, the collar look so cute too. Stylish and comfortable .. great look!! I just had my hair colored today! Went with the chocolate brown and decided to nix the red highlights. Lovely outfit, chilled but very put together at the same time :) I picked up the same jeans but in the Leigh style at Dubai Mall the other day after seeing your posts! How scary was that thunderstorm though?! I was at the Dubai Sevens but luckily got to the hotel just in time for a nap... eek! Love the outfit, and that bag is amazing! Love how it looks crossbody! I still love that bag! Isn't it strange how strongly scent relates to memory? The smell of hot, freshly-cut grass always reminds me of playing in the back yard of my grandmother's house as a child, and in that moment I'm five years old, and my grandmum is calling me in to rub sunscreen on my back. I can see her surprisingly smooth hand, and her rings glimmering in the sunlight. I've been seeing that bag all over, I'm so sad to see that it's an incredibly expensive bag that I can't afford! Wahh! cute outfit! love the wang bag! Have I been living under a rock?! Just found your blog and love it! You have amazing style--newest follower! xo. I'd love for you to check out my fashion blog, too! Love your collar and the advent calendar sounds amazing! Can't wait to see your new hairdo. The Rocky bag looks gorgeous! Excellent photography, all the photographs are looking very nice, looking gorgeous in this attractive outfit, you have described everything which is related to this photo-season like the weather of Dubai it is currently experiencing its Winter. This means thunderstorms, torrential rain and grey gloom and the detail of the outfits. Thanks for sharing this exceptional photography. I love your outfit, you look beautiful! And i love your hair!!! I have the selfridges advent calendar too :) The bag is gorgeous! You will need a current Windows operating system and you can download the C# 2005 Express edition from Microsoft at no cost to you. A user who has experience with databases and the SQL language can write a highly optimized command that can considerably reduce the size of the set of data returned from the server. Some recipients will even whip these out in the winter to tag along for their trip to the Caribbean. No matter where these go, rest assured that you'll get a brilliant glow of branding success.